Welcome to your Retreat at Lake Wylie! Offering over 350' of shoreline overlooking private cove.This unique custom home features level access to floating dock, boat house, lift and boat ramp, Over 1500sq ft patio space, covered and open. Fire pit, pool, EXCEPTIONAL outdoor entertaining.Oversized 4 car garage/boat storage(1440 sq ft) w/ buit-in cabinetry. Circular drive & porte-cochere. Dramatic interior with vaulted ceilings with the ease of 1 LEVEL LIVING! Chef's Kitchen has commercial appliances, granite tops, custom marble mosaic backsplash, center island/breakfast bar. Vaulted Great room withl stone fireplace & built ins. All Baths have granite or marble finishes! Master Retreat has direct access to Summer porch,spacious walk in closet & marble bath. 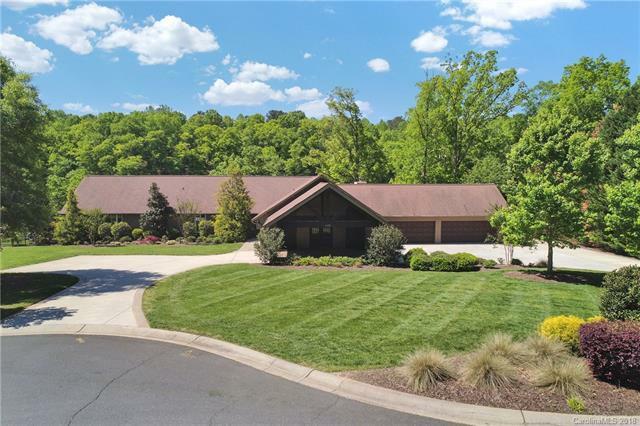 Panoramic view of the lake with main channel access only minutes away.All privately located with the conveniences of living in The Palisades all w/o HOA dues! Meticulously cared for, and beautifully landscaped, this is a true gem! Offered by Becker Group Realty. Copyright 2019 Carolina Multiple Listing Services. All rights reserved.